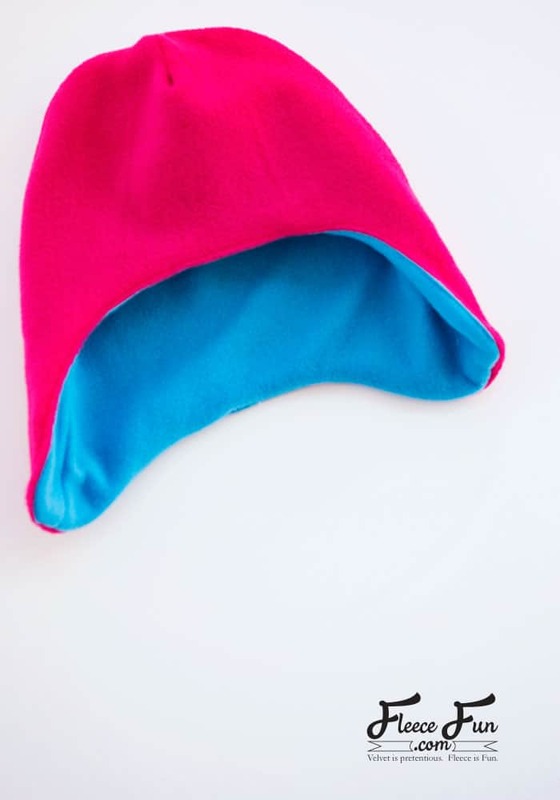 This double lined fleece hat is cute, warm and will work with most of the Halloween Hat packs! 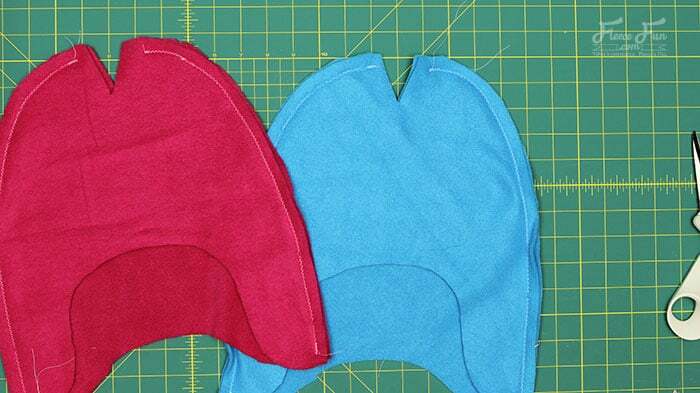 Double the warmth of the Original fleece fun hat, this fleece hat with ear flaps pattern comes over the ears to make it perfect for cold weather. Sizes child to adult for all to enjoy! There is a baby version here. The pattern doubles as the front and back pieces. 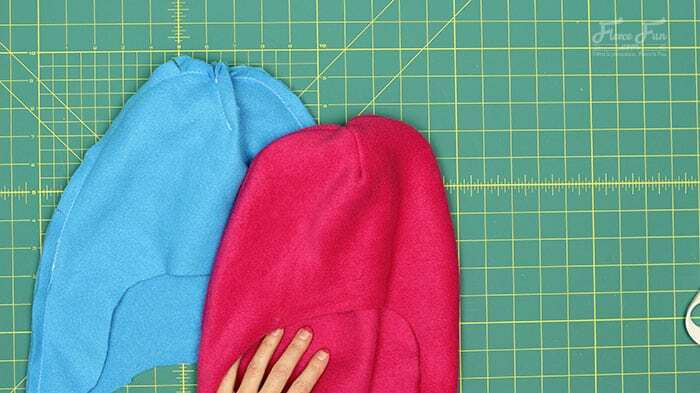 You have the option of making the hat reversible by making both the exterior and lining out of fleece. 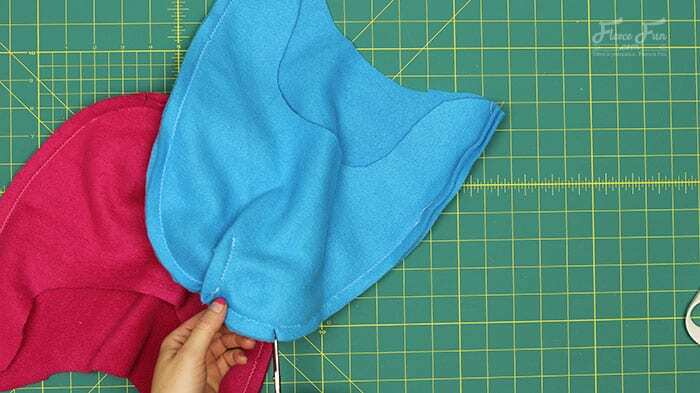 You can also make the lining out of jersey knit. 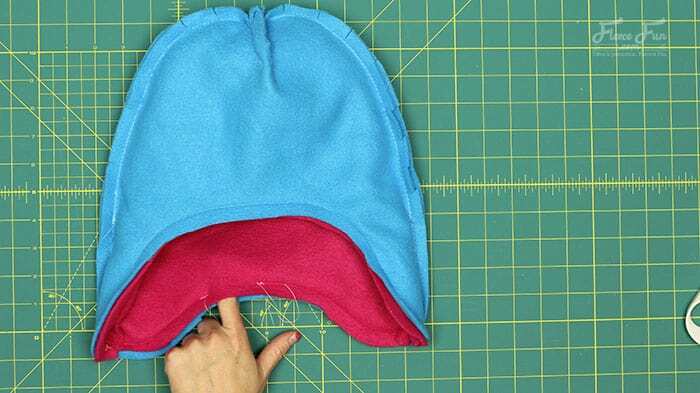 With right sides together sew the front of the exterior to the back of the exterior (note that the front and the back of the hat are not symmetrical. 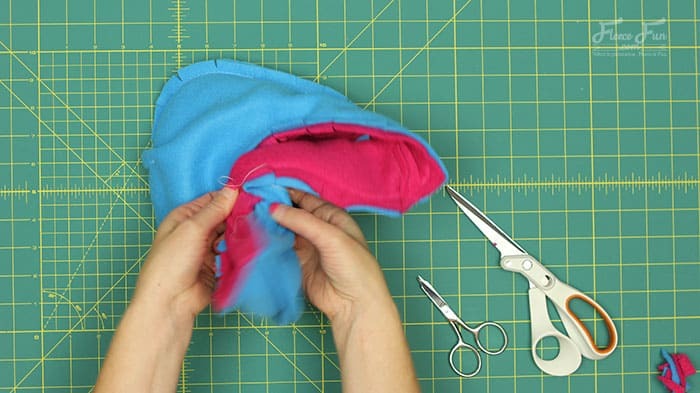 Use a .5 inch seam allowance sew the side seams together leaving the v open. Repeat with the lining. 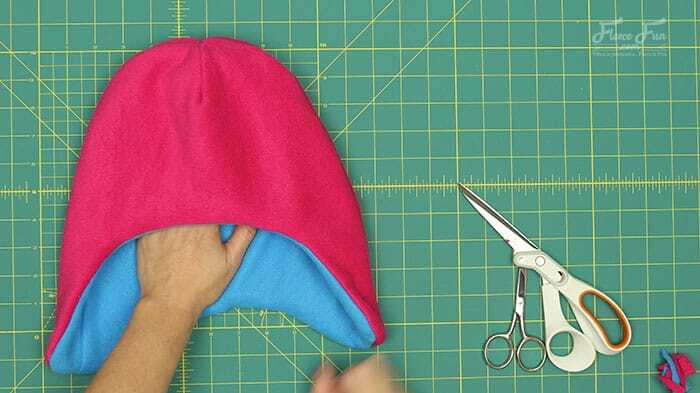 Then turning the hat, sew the v shut. 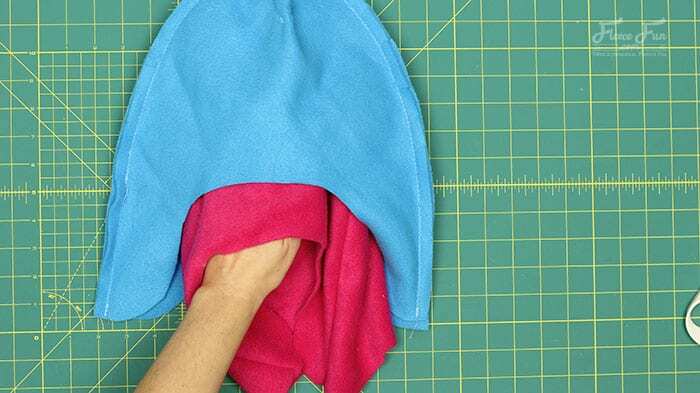 (Pinch the v together, right sides of the front together, right sides of the back together, pin, sew together in one continuous .5 inch seam). 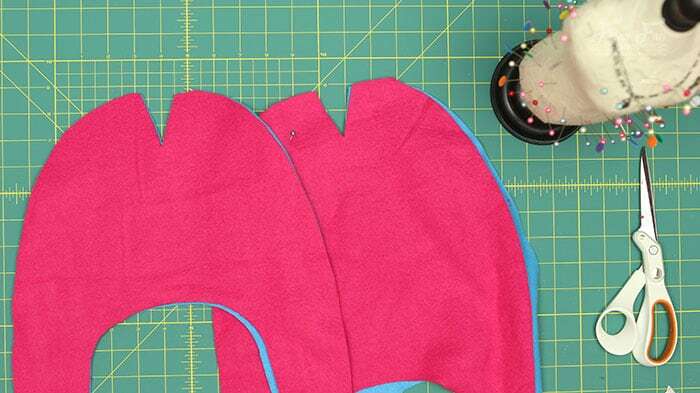 Cut slits around the top of the curves. of the lining and the exterior. Take the lining and stuff it inside the exterior, so right sides are touching. 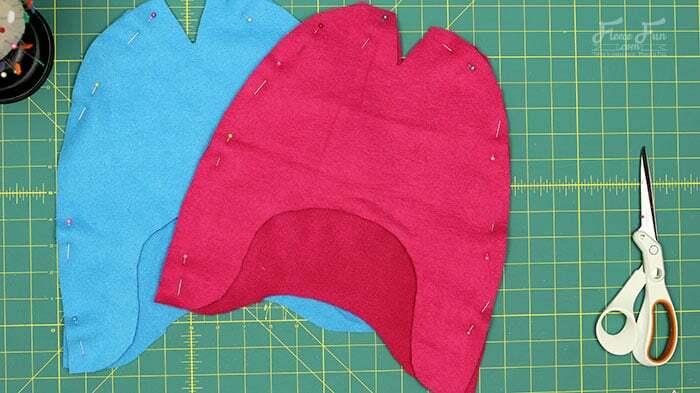 (Make sure the two front pieces are touching and the two back pieces are touching). Line up the seams and the bottoms. 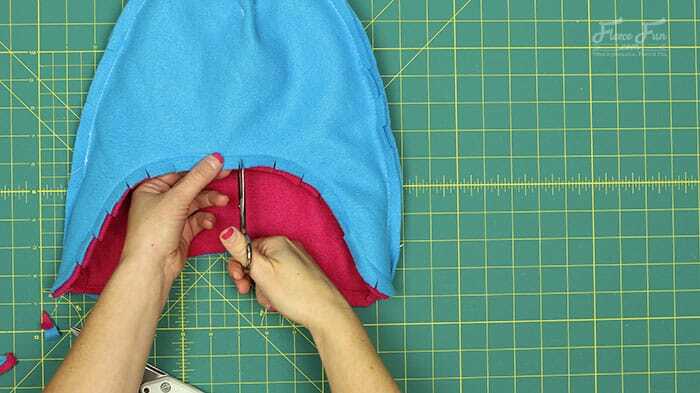 Pin the bottoms of the lining and the exterior together. 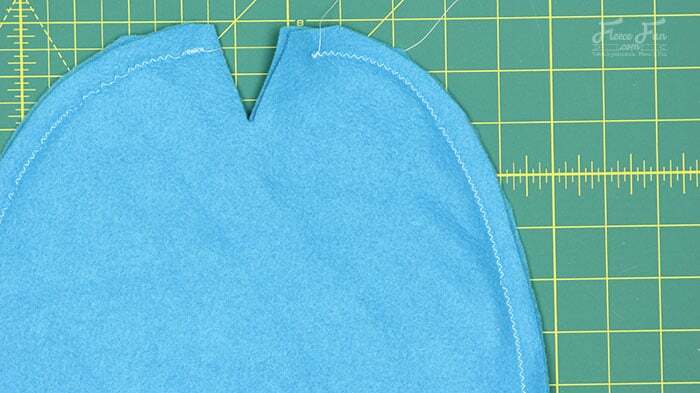 Sew all the way around the bottom using a .5 inch seam allowance, leaving a 3 inch gap for turning in the back. 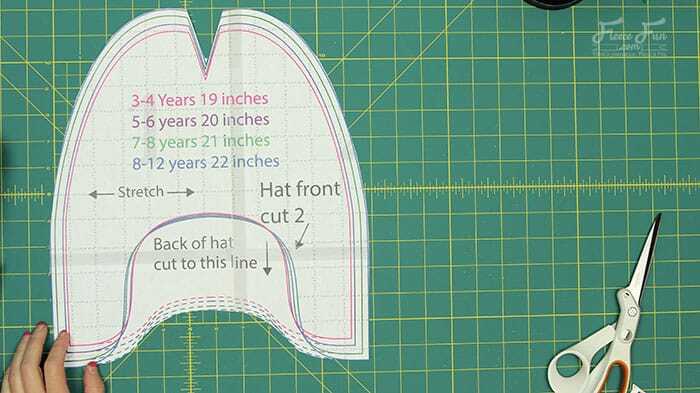 Cut slits in curves (taking care not to cut through seam allowance) and trim down places where fabric is bulky (like the ends of the straps). Turn right side out using the opening at the bottom back (work with a it a little as it is a squeeze). 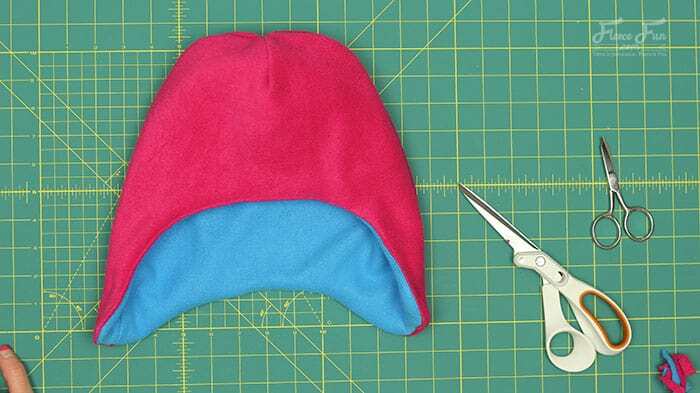 Once turned right side out, stuff the lining of the hat into place. 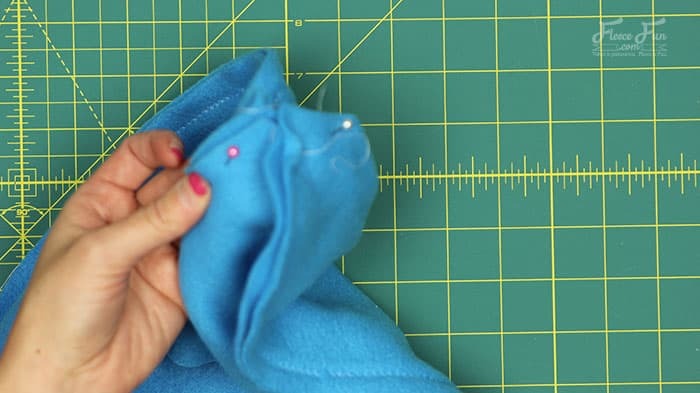 You can hand sew the gap shut or tuck in the raw edge and sew shut by machine. Top stitch all the way around the base of hat .25 away from the edge (this is optional, but highly recommended). 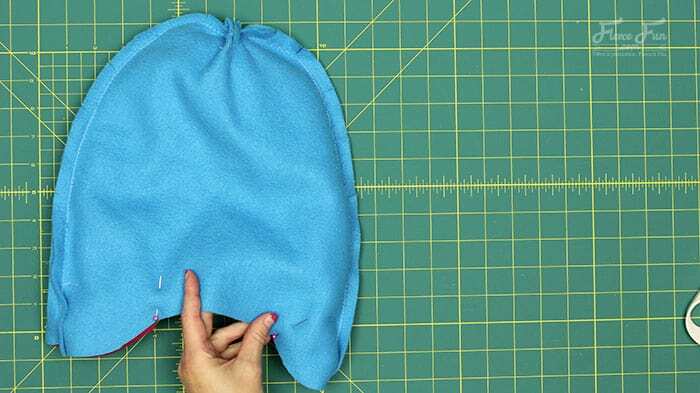 You’re finished with fleece hat with ear flaps free pattern. Sorry I had a new plugin that was causing havoc but it should be behaving now. Hi Jan I just checked the zip file and it’s correct. Double check your downloads folder. 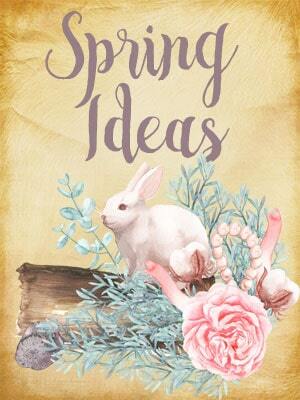 Absolutely adorable hat…just you Angel..I’m going to make some for the grandkids and the adults….excellent tutorial…fun website..thank you so much..Have a Blessed Day..Gail K.
I live in Florida, so I have no need of fleece’s warmth – this year. Last year, when I lost my hair to chemo, my head was frequently cold. Now I have my chemo curls and no need for heat again, but I do wear hearing aids and drive a very fast golf cart on our adult community streets. 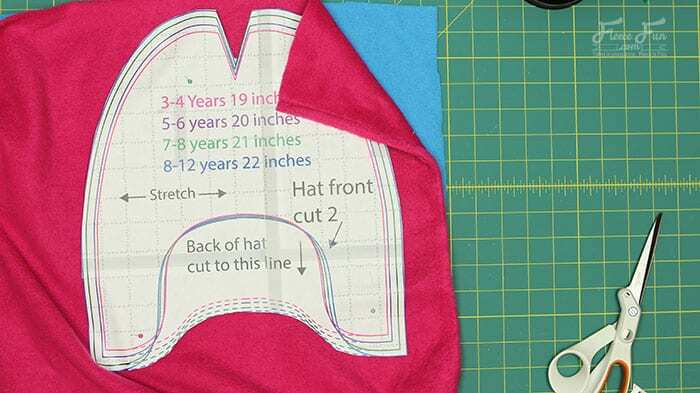 I can see this darling cap sewn in some cute novelty quilting weight cottons and worn to keep the wind from blowing off my tiny hearing aids! That’s just for me. For others, I’d love to make some of soft knits for others undergoing the trauma of hair loss and chemo, because its a double whammy painful thing. A comfort cap is so necessary on so many levels. Thank you for your generosity in providing the patterns for both children and adults. Kids feel the pain of hair loss, too. Oh, you should know that there are ads between your pictures that all say “Download Here” on big green buttons, and they have nothing to do with your sweet cap. That may cause some problems for others. 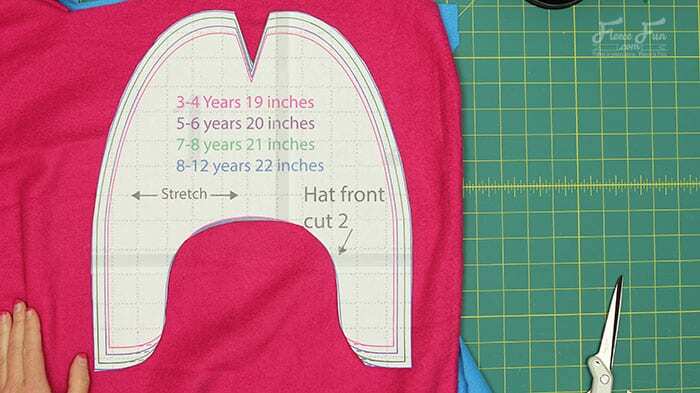 I cannot find the pattern to print it says “Get the free pattern below” but there is nothing below the writing. I bought two fleece blankets for $2.50 at Walmart and cut 7 adult sized hats. These are fun to make. I did plaid and solid reversible. Some I made with no earflaps and just rolled the edge up. Thanks for sharing. Love the pattern. Could you just email it to me. Thanks so much. Sorry I cannot email individually please fill out the form. Hi Jean, Yes there is. You just need to sign up and a zip file will be sent to you. Fill out the form you passed to make this comment. 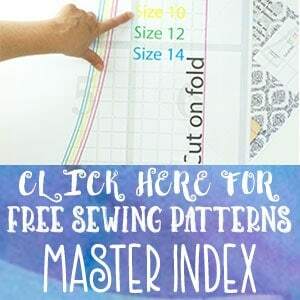 Do we have to sign up each time we would like to download each pattern? Yes, but you won’t get 5 newsletters, you’ll just get the pattern you signed up for. Half an inch unless otherwise stated. Every time I try to enter my email for the pattern I get an error. HI SHannon sorry you’re having trouble please use a different internet browser like Chrome and it should fix it. i love your patterns! I made four of the hats and took to church and they fit 4 children from one family, they were thrilled! Thanks so much, just wanted you to know you are making a difference in Peoples lives, and that of my Grandson!